The insurance industry hasn’t always been a beacon of technological innovation. Then again, its major providers haven’t always earmarked $300 million for investments in new technology and new talent like MetLife has. The strategy has already borne its first fruit in the form of a new database system and application that lets the company see everything it knows about a customer in a single place. The new application, called The Wall, is essentially a way to make the customer service experience more palatable for consumers and to lower the burden of hiring new representatives. Because it’s designed to look and function like Facebook, MetLife CIO and SVP of Regional Application Development Gary Hoberman told me, The Wall means new hires don’t have to be trained on complex enterprise call center software. 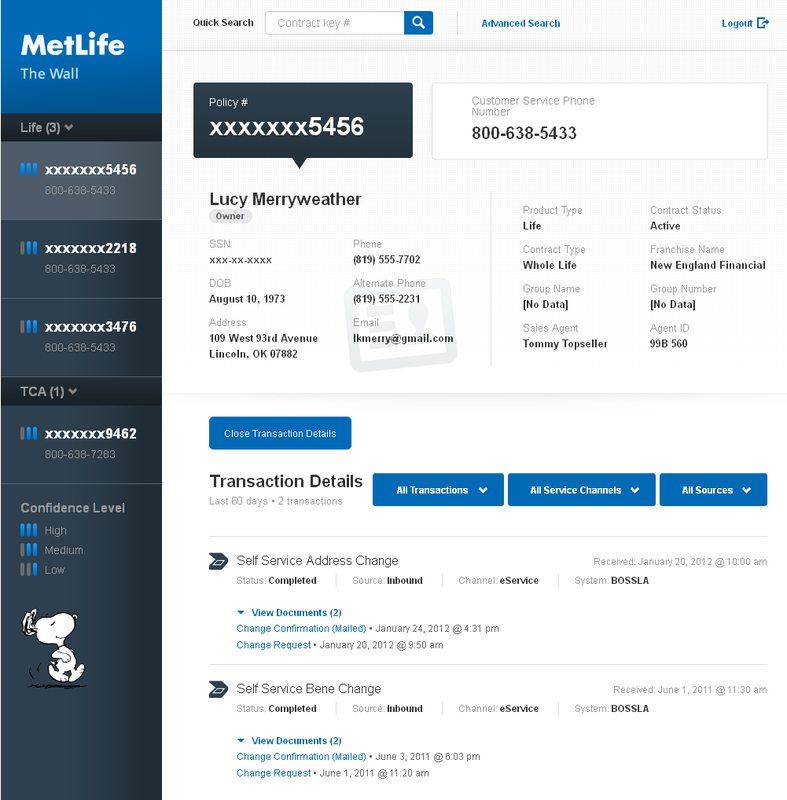 For customers calling MetLife to discuss a claim or their coverage, it means fewer annoying waits as an agent accesses data from any of dozens of different places. “Instead of seeing what someone had for dinner, [The Wall is] all a customer’s transactions,” Hoberman said. Claims, records, status, possible cross-sell information (e.g., if someone lives in an apartment and might need renter’s insurance) — it’s all in there. Looking forward, he said, it might even contain other publicly available information from social media and certain mobile apps that would give the company even greater visibility into its customers’ lives. But that’s exactly what MetLife did. In fact, it had the entire prototype built just two weeks after devising it and the production system up and running in just three months. It came together so fast because of MetLife’s new focus on cutting-edge IT and clear mission to build a useful product rather than, as Hoberman put it, “doing big data for big data’s sake.” The tech team was willingly working nights and weekends and the leadership team was directly involved because everyone understood what a fundamental change the application could have on the business. How big an undertaking was it? Built atop MongoDB, The Wall brings together data from more than 70 legacy systems and merges it into a single record. It runs across six servers in two data centers and presently stores about 24 terabytes of data. That includes MetLife’s entire U.S. customer base (some 45 million agreements in total), although the goal is to expand it to international customers and multiple languages, as well, and maybe even create a customer-facing version. It updates in near real time, just like the Facebook wall, as new customer data is entered. Building a production database system on NoSQL technology isn’t commonplace in insurance or other large industries, but it was about the only way to pull this off. Going with the relational model, Hoberman explained, would have meant figuring out a common set of schema across such a wide range of products (insurance products and terms vary from state to state and country to country) that it would have been nearly impossible to actually achieve that coveted 360-degree customer view. MongoDB let Hoberman’s team build some light schema to give the app order, but to be able to take in all the data it had available. This is only a part of what MetLife is doing with new information technologies, though, and only a fraction of what it wants to do. With The Wall, specifically, MetLife Hoberman wants to build next-best action models that will give agents guidance on how to best deal with customers. Elsewhere, the company has already used its new centralized MongoDB system to build models for predicting attrition, and it’s using Hadoop and HBase for some other workloads where they’re a better fit. It’s all thanks to a company mandate to save $450 million from its bloated technology and operations budget and then invest two-thirds of it back into new technology. “We literally have a $300 million investment to decide what’s going to be the future of MetLife,” Hoberman said. It’s kind of like being in a startup, he added, only with the resources to make sure everything is done right (much like with other large enterprises embracing open source, Hoberman’s team prototyped The Wall using open source MongoDB but brought in 10gen when it came time to build a production system). It might be easy to mock that statement, except that Hoberman and his peers are putting their money where their mouths are by bringing in new talent, as well. It’s setting up a team in the Research Triangle region of North Carolina and bringing in employees with expertise in areas such as social, mobile and big data. And Hoberman is far less concerned with specific technical skills than he is with motivation. The way they are doing this is laying off 2800 engineers and technical people in the northeast and planning to bring in North Carolina college kids to continue this work. If that’s indeed true, it was a major lapse of journalistic ethics to avoid mentioning this in the article. It certainly does seem underhanded and dirty-dealing to fund the project through the blood of other enginers. It is true but every one of those people has the opportunity to re-interview for their job moving to NC at a presumably lower salary.